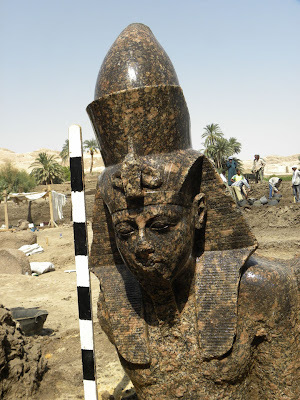 Minister of Culture announced that the SCA team working at the north west of Amenhotep III temple on west bank, Luxor in the area called Kom El Hetan,has found the upper part of a double granite statue of Amenhotep III (1410-1372 B.C). Dr. Zahi Hawass the head of the mission said that the statue represent Amenhotep III sitting on his throne next to the Theban God, Amon. Hawass believes that this statue is one of the most magnificent royal sculptures that were found recently when it comes to the attention to details and accuracy of the sculptor. Also Zahi refers that Pharaoh wearing the double crown for upper and Lower Egypt. It is known that Amenhotep III has many statues represents him with different gods and goddesses like Bastet and Sobek (currently on display at Luxor Museum which was found about 20 years ago). 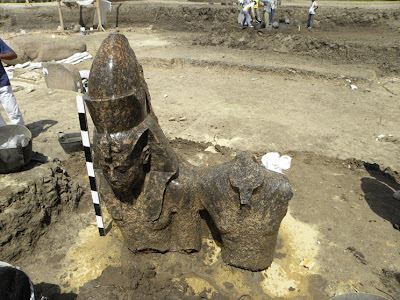 The part that was found of the statue measures 130 cm high and 95 cm wide and work is going on to uncover more parts which is expected to be around 3 meters tall when completed.